Home > Blog > Don't Sweat the Big Stuff? I imagine many of us can identify with the subtle guilt and shame that comes when we are suffering through a hard season of life…and then we stop and think about how much worse it could be. How bad can things really be, we wonder, when we live in safe, spacious homes, with refrigerators and pantries full of food, with no fear that our children will cross paths with a suicide bomber or Ebola victim on the way to school? We begin to wonder if we should put our “suffering” in quotes, if we need an attitude adjustment so we focus on gratitude rather than want, and if, perhaps, we are being a bit of a whiner. We've all heard the phrase, "Don't sweat the small stuff." For the relatively privileged of the world, is even the big stuff really small stuff that we should take in stride because our most basic needs are abundantly met? 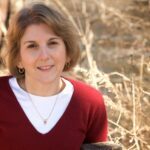 Ellen Painter Dollar is a professional writer and member of St. James’s Episcopal Church. She blogs for St. James’s every Monday, offering reflections on current events, family life, and parish life. Ellen Painter Dollar is the author of No Easy Choice: A Story of Disability, Parenthood, and Faith in an Age of Advanced Reproduction (Westminster John Knox, 2012). Her articles, blog posts, book chapters, and books have been published by the Christian Century, GeneWatch Magazine, the New York Times‘s Motherlode blog, OnFaith,Brain, Child Magazine, the Episcopal Cafe, Christianity Today, the Osteogenesis Imperfecta (OI) Foundation, Virtual Mentor (the American Medical Association’s online journal of ethics), and more. She blogs about faith, family, disability, and ethics at Patheos. The Bible is Alive...It's Alive!